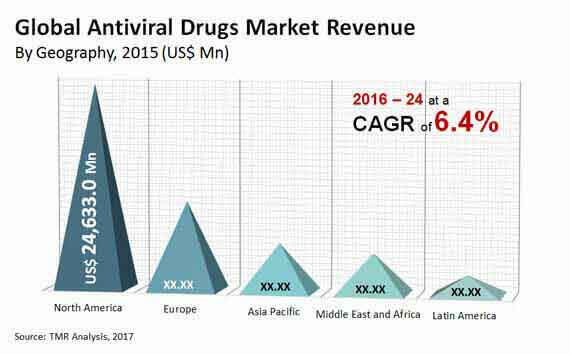 The demand within the global market for antiviral drugs has been rising on account of the growing reliance of the masses on medical treatments. A few decades back, a large population of people resorted to home remedies to cure infections and diseases which kept medication at bay. However, advancements in medical sciences and the availability of effective drugs have shifted the focus of the masses from traditional treatments to medical drugs. Owing to the aforementioned propensity, the demand within the global market for antiviral drugs is projected to reach new heights in the years to come. Furthermore, viral fever is amongst the most common forms of infection that affect the global populace, and this factor is also anticipated to reek of growth in the global market. Furthermore, the growth of the number of vendors who manufacture antiviral drugs has given a wide range of options to the masses. Transparency Market Research (TMR), in this, preview, elucidates a number of factors that have propelled demand within the global market for antiviral drugs. The global market for antiviral drugs is projected to expand at a CAGR of 6.40% over 2016 and 2024. Furthermore, the total value of the global market for antiviral drugs is expected to touch US$82.9 bn by 2024-end. Viral infections can occur as a side-effect of several other severe diseases such as cancer, diabetes, HIV, and respiratory diseases. Owing to the rising incidence of the aforementioned diseases, the demand within the global market for antiviral drugs has been rising at a robust rate in recent times. Moreover, the presence of an immaculate and resilient healthcare industry across several regional pockets has also aided the growth of the global market for antiviral drugs.The demand within the global market for antiviral drugs has been rising on account of the trust shown by masses towards antiviral drugs in curing infections. Furthermore, a number of medical professionals have begun prescribing antiviral drugs to patients which has also enhanced the growth prospects of the global market. As research and development to manufacture better antiviral drugs gathers swing, the global market is expected to expand at a boisterous rate. The demand within the global market for antiviral drugs has also been rising on account of new approvals by the Food and Drug Administration in the US. The FDA lately approved baloxavir marboxil as an effective drug for the treatment of viral infections. This approval has come as the first flu treatment mechanism for antiviral infections by FDA in 20 years. It is projected that the efforts of the healthcare professionals and organisations to educate people about antiviral drugs would aid the growth of the market for antiviral drugs in North America. The healthcare industry has become extremely focused on ensuring safety of patients, and this is another reason behind the growth of the regional market for antiviral drugs market. The report concludes with the profiles of major players in the global antiviral drugs market such as AbbVie, Inc., Bristol-Myers Squibb Company, Cipla Inc., F. Hoffmann-La Roche Ltd., Gilead Sciences Inc., Mylan N.V., GlaxoSmithKline plc. Johnson & Johnson, Merck & Co. Inc., Teva Pharmaceutical Industries Ltd., among others. The major market players are evaluated on various parameters such as company overview, financial overview, product portfolio, business strategies and recent developments.